this is the time that i either stock up on the tried-and-true favorites (like this brow pencil, this eye pencil, this primer and this one, and this mascara) or try something new (on my list: this foundation, this luminizer, and this mask). i’d love to see what’s on your list…maybe it’s something i need to try! i went to a talk at credo beauty late last year where skincare gurus kristina holey and marie veronique spoke. the one thing they focused on is your goal is to have healthy skin vs. fixing problems. it’s not just what you put on your skin, but other factors like exercise, nutrition, sleep, and stress. a few years ago, my life was in a more tumultuous place, which of course wreaked havoc on my skin (and body). now i’m feeling healthier and happier, and working on consistency in my routine. another thing holey and veronique talked about is that it usually takes multiple steps to get healthy skin vs. pinpointing one symptom. then as things change, you swap out certain things. when i’m back east and it’s more humid, i switch it up. 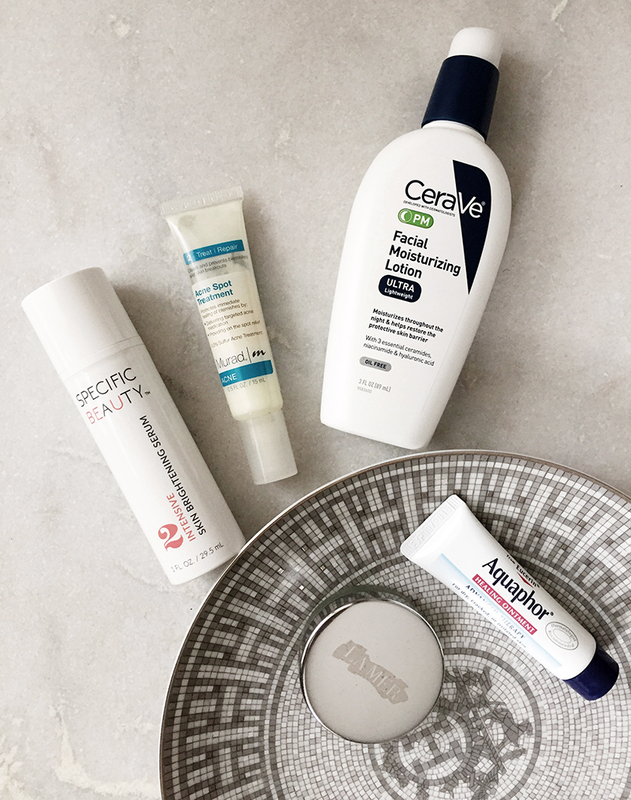 anywoo, i’ve been using most of this routine for about 4-5 months (except the glossier solution and specific beauty serum), and so far, so good. let’s get to it! i wash my face at night—removing your makeup at night is the most important thing you can do for your skin (besides wearing spf). in a pinch, i’ll use remover wipes, but really washing it is the best thing for your skin. 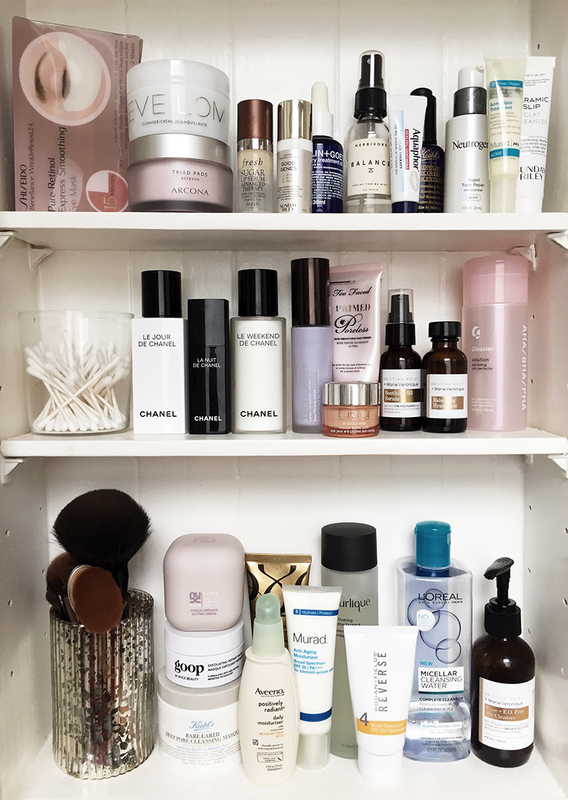 i use an oil based cleanser, kristina holey + marie veronique pure e.o. free oil cleanser. i put a few pumps in the palm of my hand, message it into my skin, then rinse. i use micellar water to remove any stubborn makeup, like mascara or matte lipstick. next i use the kristina holey + marie veronique balancing hypotonic, using a cotton pad to wipe all over. like the name says, it balances out the lipids and the moisture in your skin, and makes your skin ready for other skincare, so it works better. 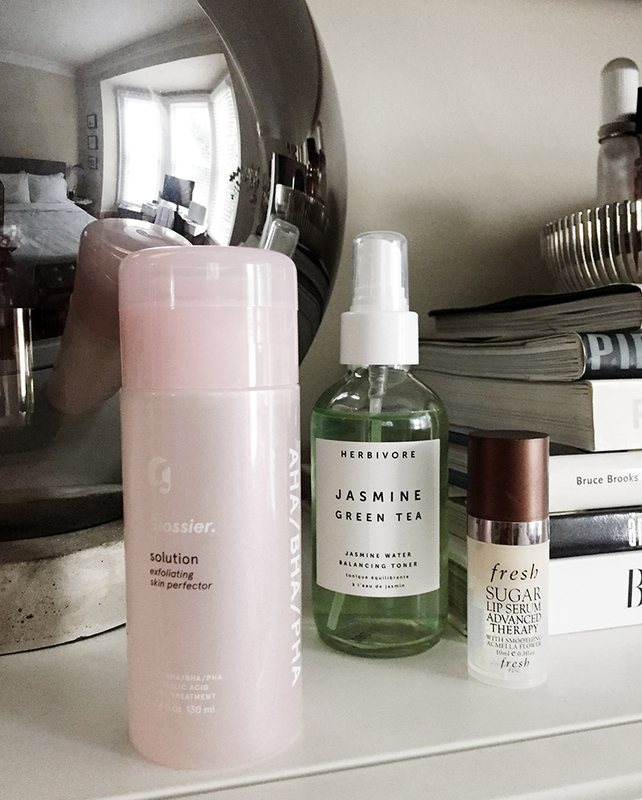 after that it gets a little trickier…i alternate nights between specific beauty’s skin brightening serum and glossier solution. the reason being is the skin brightening serum has retinol, and generally you shouldn’t use retinol at the same time you use acids (like the ones found in glossier solution). not mixing certain skincare items is something else i recently learned about (from this article and this one). the serum (and everything by specific beauty) is especially formulated for multi-hued complexions, i’ve been using it for a month and i’ve noticed dark spots have faded and my skin looks clearer. when it comes to exfoliating, i’ve swung the pendulum. in my 20s, i used biologique P50 (helena has a good review of it) when my skin was more acne prone. flash forward to moving to san francisco and my skin adjusted to the lower humidity and i didn’t break out as much. that’s when i switched to face scrubs, which can cause more harm than good. glossier’s liquid exfoliator is a combo of bha’s (salicylic acid), aha’s (glycolic and lactic acids) and pha’s. plus aloe and niacinamide to calm the skin. i haven’t used it long enough to notice a change, but so far it hasn’t caused any irritation…more to come. finally i wrap up with clinique all about eyes (i’ve been using this since high school and i like to believe it’s why i don’t generally have dark circles) and cerave pm facial moisturizing lotion, an old favorite that i’ve rediscovered. first off, i splash face with water then do 3-4 sprays of herbivore botanicals jasmine green tea balancing toner. i haven’t used a toner in years, mainly because i had read it wasn’t necessary. ha i was wrong. the one from herbivore is amazing because it’s soothing, but also regulates my skin’s ph levels so it’s not as oily, which over time means less breakouts and clearer skin. about this one is i follow that with chanel le jour resynchronizing skincare serum (it has salicylic acid to gently exfoliate and grasse jasmine extract to invigorate skin throughout the day in different environments). i follow that up with another new addition, skinceuticals c e ferulic oil. raise your hand if you have oily skin and thought you shouldn’t use oils…that would be me. welp, this stuff is the real deal. yes, it’s pricey. but it brightens the skin, gives extra protection against the environment, and helps strengthen your SPF protection. finally, i use murad anti-aging moisturizer with spf 30.
sheet and combo masks have been a big deal recently, but i’m more into a good clay mask. i do kiehl’s rare earth deep pore cleansing mask every week or use the malin + goetz clarifying clay mask if my skin is being extra. 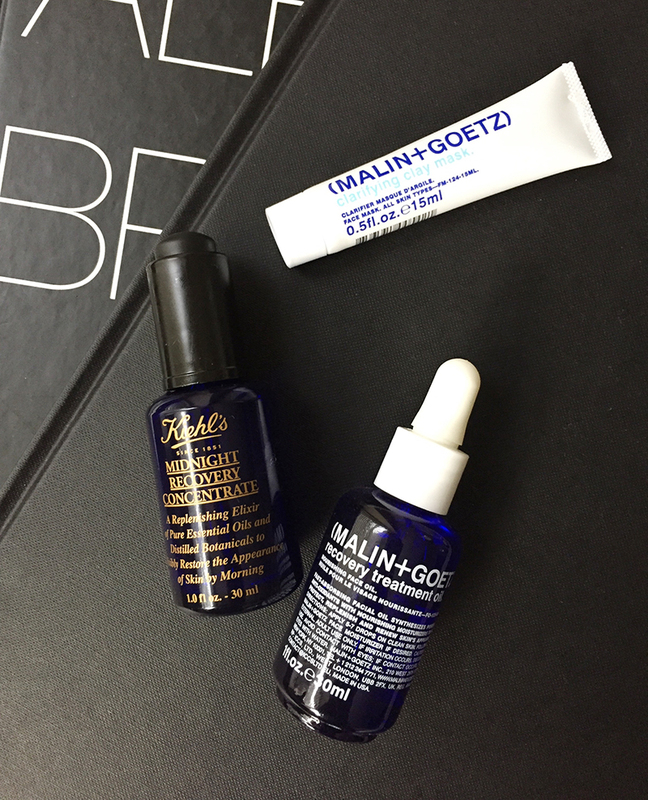 two other face oils i love, especially when i’m traveling are kiehl’s midnight recovery concentrate and malin + goetz recovery treatment oil. when i fly east, i usually take a red-eye, so i’ll head to the airport sans makeup, then put one of these on right after getting through security. i also like the fresh peony brightening night treatment mask (it’s basically a concentrated cream you put on before bed) for the days when i don’t want to do all the evening steps or i’m on vacation. it has hyaluronic acid to hold in moisture while peony and licorice root help even skin tone. if i do get a breakout, i use murad rapid relief acne spot treatment, which soothes with vitamins c and e while going on clear. for my lips, i’ve been using the fresh lip serum advanced therapy at night, and i usually carry aquaphor or la mer lip balm in my bag. there you have it…wow that was a long but hopefully informative post. let me know in the comments if you have questions or like posts like this. this post is not sponsored but i did receive samples of specific beauty’s skincare line to test. all opinions are my own. Previous Post fan print + lulu frost digital sample sale. Next Post leather and lace.